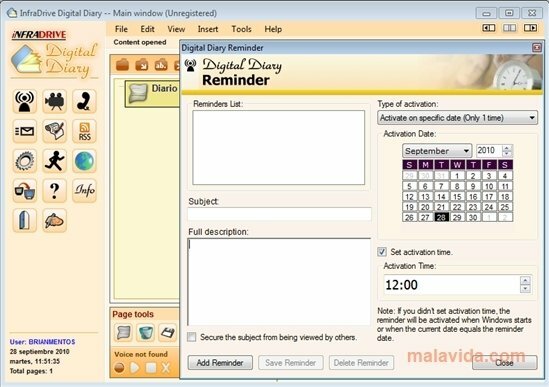 InfraDrive Digital Diary is an interesting application to write your personal diary from your computer, with many added advantages. What's more, it also allows to organize your tasks and stay informed. The first things that you have to do is create a personal account, with a name and a password, so that nobody will be able to invade your privacy. Once you have do this, you can start to write or record your voice so as to complete your diary. InfraDrive Digital Diary also allows to read the latest new by means of RSS feeds, and sending emails to your contacts. You will be able to organize your diary as you consider most appropriate, and even better still, it has a search engine that will allow you to search for any of the diary's contents. InfraDrive Digital Diary has many customization possibilities for your diary: you can create an unlimited amount of pages for each contents or folder, you can modify your diary by changing the fonts, the color or the size. 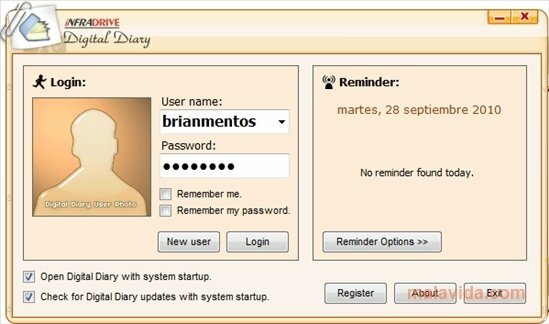 Discover this application and write a digital diary from your computer.